The latest Brown Girls comic made me cringe with unease when it popped up on my blogreader this week. Swiped from my latest blog addiction, Devis With Babies, this week’s Brown Girls episode made me wonder just how many similar conversations were had this election cycle. As a SDMF (Single Desi Muslim Female) in my twenties, I’ve had my fair share of Brown Girls-type talk, usually over brunch and usually about boys. Many boys. Over the years, I’ve dated a Desi Hindu and a Black Muslim and I’ve always wondered with whom my parents would cringe less with — would their racial prejudice or Muslim orthodoxy take precedence? I’ve always thought they would be more accepting of a Muslim man, no matter what race, but my friends always begged to differ that racism prevailed over all. Of course, I would like to think that my parents would accept anyone that I would love, but we all know the desi Bradley effect there. Truth is no boy over the years has met the bar to be introduced to my parents so I have no way to test this effect yet. But I am curious, if Obama is elected President, and my parents vote for him, will it be more acceptable for me to bring home a black man? If elected, will Obama essentially increase the desi dating pool of what boys us SDMFs can bring home? Single brown girls, what are your experiences with the Desi Dating Bradley Effect? Way to go, Devis, on hitting the nail on the head on this one. I am Brown Girls comic latest biggest fan. Other Brown Girls Comics: Episode 1, Episode 2, and Episode 3. Western peoples’ idea of marriage is very different from ours. Very true. Instill American individualism and independence with respect to personal life issues. Then all problems will take care of itself. If the kids still want some exposure to desi culture how about taking an internship or temporary job in India or make friends with “cultured” DBDs or join South-Asian studies program in univs ? I’m sorry, but who are you to tell Indian parents how to raise their kids? I’m proud of my Indian heritage and Hindu faith. Who in world would want mutt children anyway? I’m not ready to throw my kids off into the deep end of American multiculturalism. All I said was that working to retain one’s cultural identity and intending to pass it on to the next generation is a good thing. And trying to label people who feel that way as “backwards,” “regressive,” or “racist” is exactly the kind of homogenizing, Westernizing influence that would have made Macaulay proud. As long as I live a stable and fulfilling life, and I’m comfortable in my identity as a person, does it really matter whether I adhere to my parents’ lifestyles? I think way too much emphasis has been placed on preserving culture for culture’s sake. 136 Ã‚Â· Brigette Gabriel on October 27, 2008 08:10 AM Btw since many are throwing culture and tradition generously. Let me try to first define desi/south-asian culture in the US context in attempt to understand/discuss the Desi Bradley effect ? (a) Visiting temples/gurdwaras/mosques/churches (b) Learning some south-asian dance, song or art form (c) fan of Bollywood (d) Celebrating desi festivals and wearing south-asian dress for festivals/parties etc. (e) Discussing south-asian politics and relevance to US policies or desi immigrants (f) desi traditional or mixed style marriage. a) Well, I’m Roman Catholic, so I attend an American church. But I’ve been to the Indian churches a few times, seen a temple once. Check. b) Most of my community’s song and dance participants are girls. I was an art major in college. I’ll consider Malayalam an art form, and I know it, so I’ll give the above total a cumulative check. c) I like Bollywood! Check. d) I attended India Association events in college, plus my family and I did the circuit in grade and high school. I used to wear more traditional Indian garb to some of the events, but as time went on, dress-code has been simplified for males: suit, shirt, tie. So I’ll give me a check, more or less. e) Discussing South Asian politics? No check. Discussing South Asians in American politics/ how US politics affects Desi immigrants? Check with a bullet! f) Marriage: I’m single. So no check. But I’ve attended Malayalee weddings. Check. I don’t know what format my wedding will take. So I’ll say no check, with an option for check. 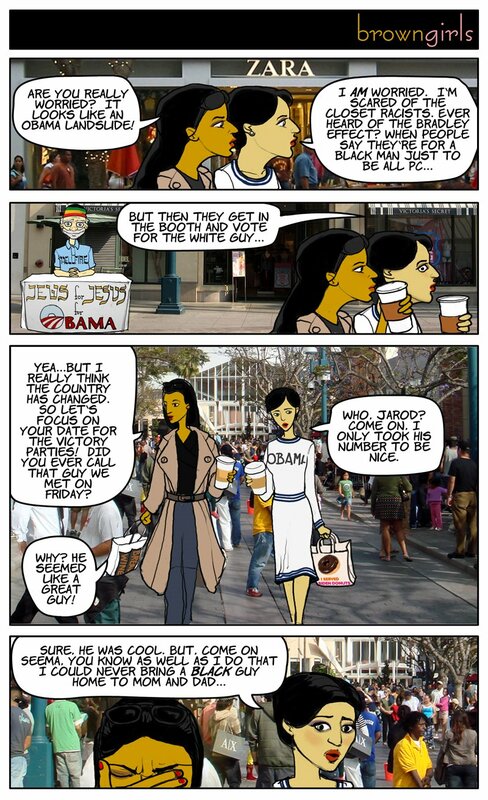 Taz, I wrote the “Brown Girls” comic that you posted over the weekend–thanks for putting it up, love all the dialogue it provoked. I was going to post a response of some sort on our blog this afternoon and was planning on posting it on Sepia too, but just noticed that the comments are closed Admin: Here is the response on Deepa’s blog.